Hypnosis is a first choice for restoring self-esteem and confidence because IT WORKS. Call Inspire Hypnosis in Redding, CA for your free screening to find out if hypnosis is right for you. Poor self-esteem has a destructive ripple effect on every aspect of life. Improving poor self-esteem with hypnosis is a relatively simple and easy task because it is a result of flawed self-perception. No one is born with poor self-esteem. It's manufactured by negative thought patterns. Specifically, thoughts of self-persecution. For example, not being "good enough." Poor self-esteem is a perceptual problem. Alter, or change, how you perceive yourself and you change your perception of the world around you. The primary benefit of hypnosis is its capability to influence thought and perception. People stop smoking with hypnosis because they no longer perceive themselves a smoker. They see themselves as a non smoker. Aggravation and withdrawal is minimized by a simple change in self-perception. Same holds true for weight loss. The overweight change self-perception from that of being a fat person indulging in fat habits, to a thin person who no longer wants, needs or participates in the unwanted behavior that created excessive body weight. Hypnosis works in the same way to restore or develop self-esteem. More simply, change your thoughts and change your world. End self-persecution and self-limiting thought patterns. Replace them with new, beneficial and positive thought patterns. Hypnosis is a first choice for restoring self-esteem because it works. Hypnotic applications like stress reduction, improving grades, restoring self-esteem and confidence have extremely high success rates. Regardless of the origin of poor self-esteem – relationships, school, work, family or money – hypnosis can make positive improvements in a relatively short time at a very reasonable cost. If you are suffering from poor self-esteem and lack of confidence, it's completely unnecessary. Poor self-esteem is a result of thought. What you think is a choice you make. If you don't control your thoughts, who does? I urge you to take back control. Build unshakable confidence, release unnecessary fears and self-limiting behavior. Restore self-esteem with hypnosis. It really is the smart choice. Call me, Marge Perry, at Inspire Hypnosis and we can schedule a free hypnotic screening for you. 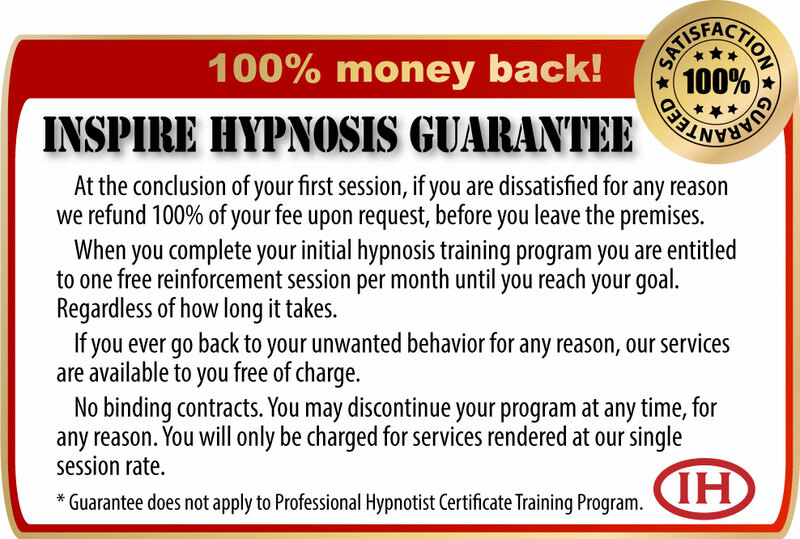 We can discuss your situation and asses to what degree hypnosis will help you restore self-esteem. I also recommend my Self-esteem, Hypnosis & You post on my Inspiring Thoughts Blog. Call soon. Poor self-esteem hurts and adversely affects every area of your life.